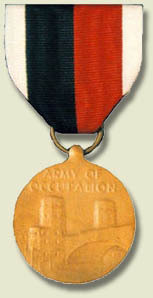 Awarded: Awarded for 30 days of service in one of the occupied territories in Europe after World War II between May 9, 1945 and March 2, 1946 or for service in Berlin between May 9, 1945 and October 2, 1990. Ribbon: Half black, half red with white edges. Plane Device: This device is worn with the Army of Occupation Medal to denote service of 90 consecutive days in direct support of the Berlin Airlift (June 26, 1948, to Sept. 30, 1949). Germany Clasp: The Germany clasp was worn on the fullsize medal for service in Berlin. 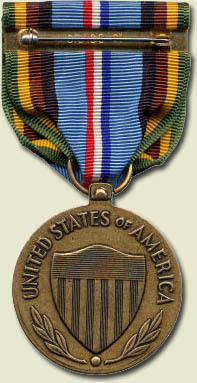 Awarded: For service between 26 June 1948 and 30 September 1949 in support of the Berlin Airlift. Instituted: 20 July 1949 by Act of Congress. Ribbon: Grey-blue with a white-edged red central stripe and black and white edges. 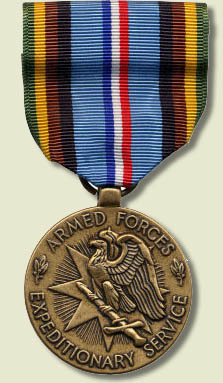 Awarded: For service in Berlin 14 Aug 61 - 1 Jun 63. Instituted: President Kennedy established the Armed Forces Expeditionary Medal, per Executive Order 10977, dated 4 December 1961, for operations on or after 1 July 1958. Ribbon: The ribbon is 1 3/8 inches wide and consists of the following stripes: 3/16 inch green 67129; 3/16 inch golden yellow 67104; 3/16 inch spicebrown 67196; 3/16 inch black 67138; 7/16 inch bluebird 67117; 1/8 inch ultramarine blue 67118; 1/8 inch white 67101; 1/8 inch scarlet; 7/16 inch bluebird; 3/16 inch black; 3/16 inch spicebrown; 3/16 inch golden yellow; and 3/16 inch green.